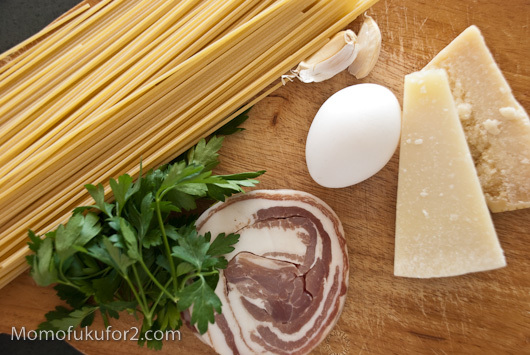 Is there anything more delicious than crispy pork, eggs, pasta and cheese? Carbonara just may be my favourite way to eat breakfast foods at dinner. 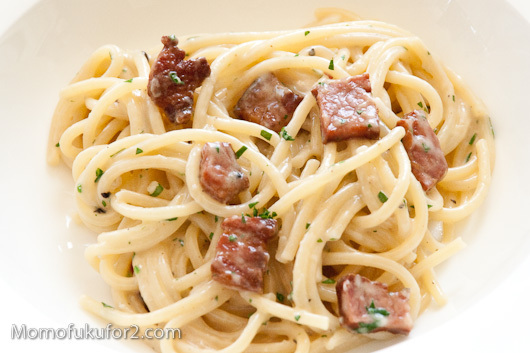 The very first time I heard about carbonara, I was in my late teens. I was working at a deli/bakery, and my manager was a super-sweet Italian woman who would chat with me about all the delicious Italian dishes she would cook for her husband, two sons and daughter. One day, she told me she made carbonara for dinner. I told her I’d never heard of it and put her in some major shock. I know now that carbonara is a classic Italian dish, but at the time, I hadn’t really explored Italian cuisine. Sheri, my manager, took it upon herself to teach me the ways of carbonara. It sounded easy enough and to a bacon and egg lover like me, I had to try it immediately. What Sheri didn’t mention was the fact that carbonara making is a lesson in timing. My first attempt was sort of a bacon and scrambled egg pasta. Delicious, but nothing like the creamy sauce I’d heard about. It took me a while, but I managed to figure it out. This Marcella Hazan carbonara recipe is pretty good. I love the flavour you get from the garlic and deglazing with white wine. 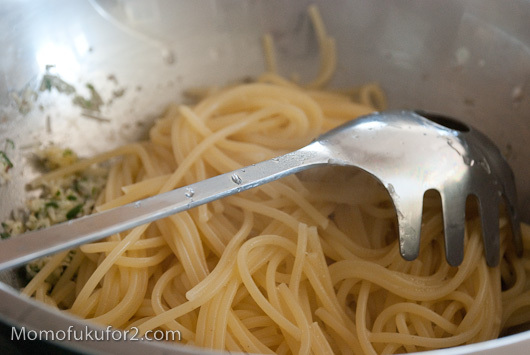 Start by boiling a pot of water and then cooking your pasta according to the package. Time it so that everything else is prepared by the time the pasta is cooked. 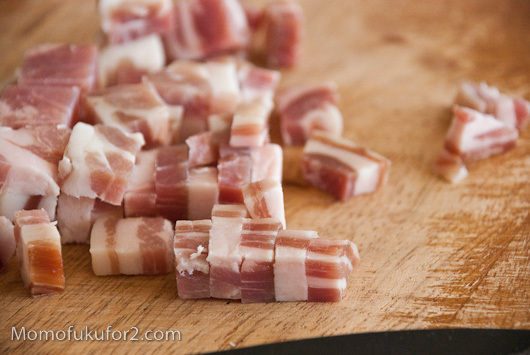 Cut the pancetta into strips not quite 1/4 inch wide. Lightly crush the garlic with a knife handle, enough to split it and loosen the skin, which you will discard. Put the garlic and olive oil into a small sauté pan and turn on the heat to medium high. Sauté until the garlic becomes coloured a deep gold and remove. 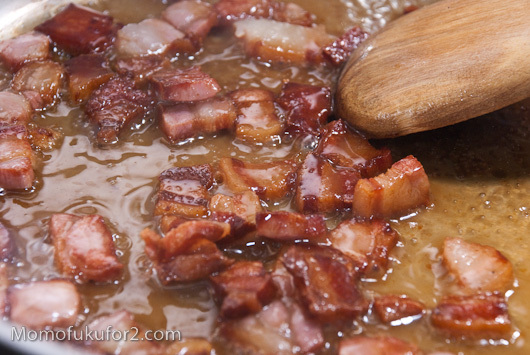 Fry the pancetta until it starts to crisp at the edges. 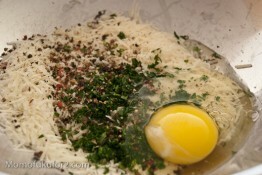 Add the wine and let it bubble for a minute or two and then turn off the heat. coating the strands well. 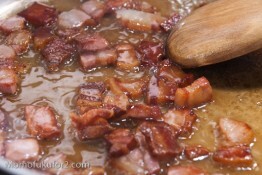 Add the entire contents of the bacon pan into the bowl, toss thoroughly again, and enjoy at once. Wow, thanks! I always thought carbonara was full of cream and very unhealthy which might be why I’ve never made it. I’m glad to learn I was mistaken! I think I’ll have to try making this very soon, so simple and it looks delicious. Rogers and Grey put a lot of cream in their carbonara, but I think that is over the top. So unnecessary. The natural creaminess of this sauce comes not from cream, but from the egg and the cheeses melting in contact with the hot pasta. It is so good no one should deprive herself of it, occasionally at least. I may even make it tonight. I like the way your manager made it more than this recipe you posted. 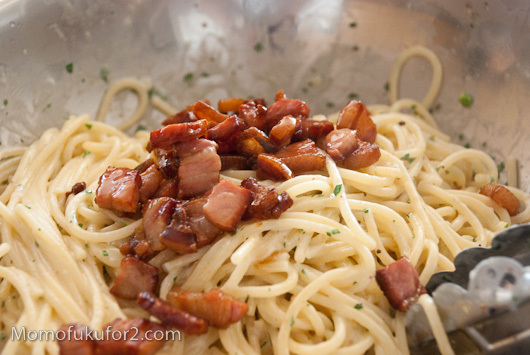 I love the simplicity and intensity of a true carbonara. I’m craving some right now. This is much more simple then ours. Carbonara? In the summer? You guys are animals! Is the garlic ever added back in? This sounds amazing, I want to make sure I make it right! In the recipe, it isn’t, so I just snacked on it while I was cooking. Awesome post and your Carboonara looks so creamy! But only 1 egg and 1 1/2 tablespoons oil for over 1/2 pound pasta? The sauce isn’t traditional and includes everything they deglaze off the pan, so not as much egg is needed. 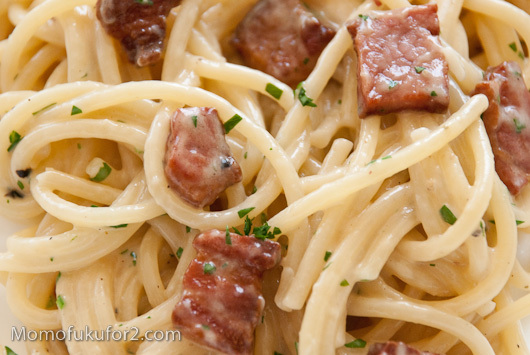 Here’s a recipe for Fettuccine Carbonara you may like to try.